Are GMO Potatoes sold in South Africa? The simple answer is no. For a number of years (almost 12 in fact) the ARC has been trying to get the GMO potato SpuntaG2 approved for production and sale in South Africa. Fortunately, the application was declined twice, for a few good reasons. Concerns over health reasons, as the potato produces an insecticidal protein in its cells. In addition the potato is resistant to Tuber Moth and this is not considered a major pest in South Africa. And finally, no actual benefit could be shown to commercial or small scale farmers in South Africa, therefore the application was turned down. So, rest in comfort. None of the potatoes that you buy on the shelves in South Africa are Genetically Infected. All you need to worry about is choosing the correct potato for the dish you are preparing. 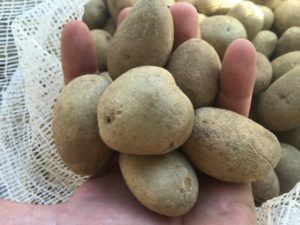 There is however a huge shortage of locally available seed potatoes in South Africa, a number of harvests have been denied disease-free certification. Unable to be planted for harvest, they are thus sold on the market as table potatoes. This is in addition to the severe drought that we experienced last season, potato prices are never going to be at the R25/per bag that we got so accustomed to buying them at. The new normal is R80 -R100 per pocket. Do not fear, there is nothing wrong with the table potatoes, they are 100% edible, they just cannot be planed to create a crop. One of the main problems for home gardeners is that they will plant a sprouting store-bought potato. This is false economy and could dramatically affect the harvests of related crops. Most virus and diseases that affect potatoes will also affect Tomatoes, Peppers, Chillies and Brinjals. So the few ‘cheap’ sprouting potatoes has the potential to adversely affect other crops for years to come, as the disease remains in the soil. One of the best ways to get the best potatoes is to plant your own certified seed potatoes. Livingseeds has a selection of certified seed potatoes that are ready for planting. ← Succession Planting: Do it correctly. they are 100% edible, they just cannot be planed to create a crop. I would think more this line?? Please advise where I can find a description of the different seed potatoes. Also where I can purchase . Hi Julia please see here for descriptions of varieties that we supply. You can also order directly on the site. we are running low on stocks though, so don’t leave it too long. Isn’t that what GMO plants are all about (unable to reproduce)? They cannot or at least should not be planted for harvest as they are diseased tubers. If you do plant them then you are almost guaranteed a crop failure in addition to infecting your soil.